Laskarina Bouboulina was a Greek naval commander, heroine of the Greek War of Independence in 1821, and the first woman- admiral of the Imperial Russian Navy. Bouboulina grew up with a love of the sea. Through wise investments she was able to buy several ships, including the Agememnon, the largest warship in the 1821 revolution against the Turks. 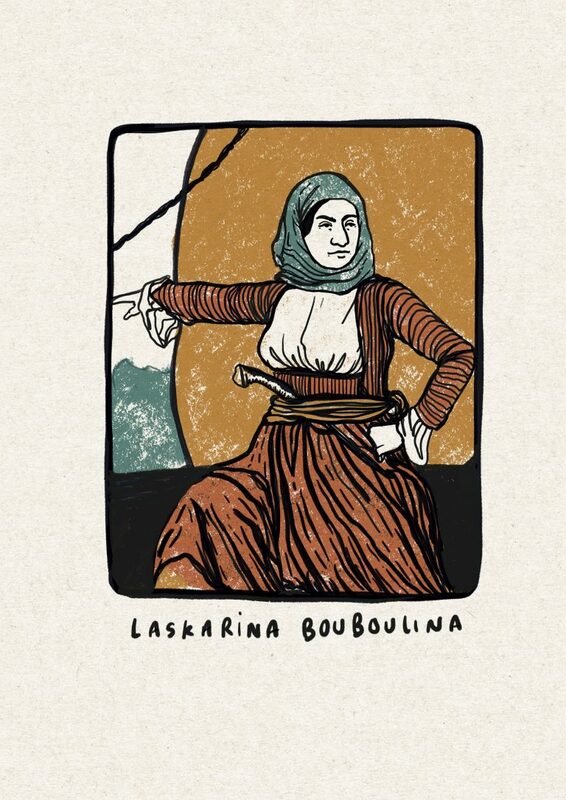 Bouboulina was a member of the underground organization, Filiki Etairia (Friendly Society), which worked to prepare the Greeks for the revolution against the Ottoman Empire. She was the only woman in the organisation. On March 13th 1821, twelve days before the beginning of the War of Independence, the first revolutionary flag was raised on the island of Spetses by Bouboulina. On April 3rd Spetses revolted, followed by the islands of Hydra and Psara with a total of over 300 ships between them. Bouboulina and her fleet of 8 ships sailed to Nafplion where she began a naval blockade. Later she was able to capture Monemvasia and Pylos and was considered an equal with the rest of the generals when planning strategy. Bouboulina arrived in Tripolis in time to witness its fall on 11 September 1821. During the ensuing defeat of the Ottoman garrison, Bouboulina saved most of the female members of the sultan’s household. Bouboulina became a national hero, one of the first women to play a major role in a revolution. Without her and her ships the Greeks might not have gained their independence.